Internet - Are You Using the Net to Improve Your Life... or for Fun? Internet to Enter the World! First of all, people who don't use the internet are living in their own isolated world, wether they are young, or old. Get focused on the three sections of the page. There are demands and requirements to use this media right. They should use it to live in harmony with the development of this world and to enter the world we know and maybe be known globally. But, that is OK, if they don't want to. Everybody in this world has his own ways and rights to live, as he wishes. However, it will always be better for folk, as they live in this life only once, to live something that could change their lives to the best. This is of course better for everyone than to live in a world of his own. Well, people actually could create the world of their own, but still make the best world ever by using the positive technologies we know to make that world better. The positive technologies are those we know as environment friendly. The third is how to start learning from free resources to do all the things you want to do to improve your life. How to Use the Internet for Fun and Knowledge? People use the internet for different reasons than to make profits. Great numbers of people use it more than they read newspapers or watch musical movies on TV channels. Interestingly, they watch many film genres on even small devices like iPad. Most of the internet users go to social networks, forums, video services like Youtube and TV movies like Amazon. Great numbers of people do not even read news on the Web. They are looking for many kinds of entertainment, chatting and enjoyable programs. That is possibly means a waste time. However, wise people know how to enjoy wasting time and making some profits from this lost time. Moreover, there are increasingly more people using the internet and do not know the web is a very dangerous place. Those people do not know there are spying software, malware, warms, viruses, frauds of all kinds and numerous IP dangers on the net. I call warms, spam, and the others of course, tools for identity high jacking (the fragment of hijacking through these tools), or tools of identity theft. Do not download any music or video from a site that you do not know or trust. Don't use any security beside Apple in any Apple machine. Neglect all the noises in this regard. Use strong anti-virus program like F-Secure, MacAfee and Norton to protect your digital lifestyle with one of these security suites and protect your system. Scan your email messages even from people you know before opening them. Setup your anti-virus and Firewall program to perform an automated system protection. Do not give full details about you on websites you do not know much about them. Always, seek advices about the INTERNET security from people you know and trust. Investigate the search engines you want to use. See their privacy and read carefully to know how they tret your information and when and how they collect informations about you and why. Use the search engine you trust most to make your search experiences better. (You can always check your search history, instead of typing keyword terms repeatedly). Use Google Chrome to fine tune your browsing. (Chrome helps you put all those sites you enjoy on your main browsing page in screen shoots). MAC Safari is good too and it has its own protection, despite the article at Safari the worst internet browser in the world. Befriend people you know through the social media network you trust and enjoy chatting with them. However, always make sure that your social media never send invitation spam to your other email addresses and never download malware to your computer. If you received spam from any social media to your other emails, know that media is not good even if it has billions of people and quit that media. 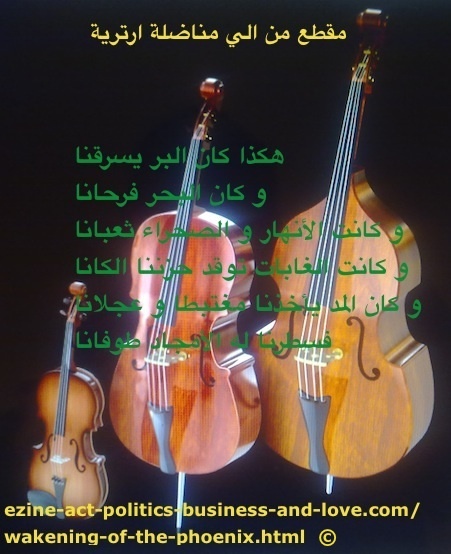 Arabic poems on the net: A couplet of poetry to an Eritrean woman fighter in the Eritrean revolution of the EPLF. How to Use the Internet for Profits? If you are not using the internet, then consider yourself as a person living in his own isolated world, wether you are young, or old. It is OK for you and for relatives I know that don't use the net. So, this is something we couldn't discuss here. If you are using it for fun, there are many ways to use it to do more than only chatting, watching videos, hearing music, playing games online, or even reading news and other information o n arts and cultures. You can use it to make some other things to profit from it too. This is to say for example, if you know some great information about something, you can use this information on a website you build to profit from the web. To do this, simply search, research and study this information to build it on a website targeted to great numbers of audience who are looking for that same information you know great deal about it. Asking for more insights on how to do that on the Internet? Here is how to handle taking your knowledge on a business of your own on the net and make profit from it guaranteed. The process of using the internet to make profits has only some scientific steps to implement. Those scientific steps lay the grounds to build your brand of one. Form these terms into open questions that don't end with one answer. Look for some partners in success (see the Ezine Acts Associate Programs) to work with them to monetize your pages. how to monetize that free traffic, even through every single paragraph. how to build automated content every time you build a webpage without lifting a finger at your website blog, as you see through the update at the Ezine Act Blog. There's nothing to prove accuracy in this regard, as SBI. There are also some good articles to use the internet the best way you can at the Ezine Acts Articles (site map 9 A), with its extension into Ezine Acts Articles Section (site map 9 B), Ezine Act Articles Index (site map 9 C), Ezine Articles (site map 9 D), Submit Articles (site map 9 E) and Submit Ezine Articles (site map 9 F). If you liked this internet article, please use the "like" and "tweet" buttons at the top, or at the bottom of the internet page to like and tweet it to Twitter, or share it with the other services you see on the small buttons. Pin one of the Ezine Acts Pictures on this page, or at the Ezine Acts Galleries, Ezine Acts Photo Gallery and Pictures for Your Website. Thanks. The Solo Build It tools on the image below are all combined in one place to help you focus on your hobby, knowledge, passion, any of your personal experiences, or any of the things that interest you to build it a strong home based business on the net. They empower this page about the internet and the entire of Khalid Osmans Network at the Ezine Act, Politics, Business and Love and update it at the Ezine Act Blog.